Now that Drupalcon Dublin is over—and now that I've stopped going to bed thinking "another day at the conference tomorrow, then? "—it's worth taking stock of what happened. I had a great time, once again. I think with Drupalcons you do get more out of them, the more you put in: if you're only going to see sessions, then you'll get what those talks give you; but you merely have to augment this with room monitoring, and you start to have conversations—however brief—with the volunteer team and the speakers. And if you move a little away from session-after-session, and start chatting in hallways and over meals, then other discussions start to open up, and you make more connections, join more dots.... I did spend more time this year in sessions than out (see below), but I also tried to follow those sessions on, with chats, and room-monitored where I could. I've also found over the past couple of Drupalcons that not drinking alcohol (well, not really drinking very much, as this was Dublin after all) really improved my experience: evening socials are better because you make more genuine connections; and morning starts are better because you avoid a foggy head. Usually I try to detect a few themes in the sessions, but this time round I'm slightly hampered by my focussing on Drupal 8 upskilling in my choice of session. There's finally no doubt that Drupal 9 is on the horizon: core conversations were definitely discussing it. But in some of them—especially benjy's eye-opening talk about Migrate, with contributions from the floor—there was as much discussion about the 8.2 beta, and the 8.3 dev horizon, as there was about 9. A lot of this is coming about because of the move to semantic versioning: no longer are we all focussed on getting our pet change into the next major Drupal version, but looking to the minor versions to include what we want, spreading the focus. But what's even more interesting is that Drupal 7 is still receiving attention: the live patch at the mentored sprints (more on them later) was to 7! The defusing of Drupal's boom-and-bust cycle up in the semantic versioning stratosphere seems to have at the same time relieved tension down at the lower levels. This bodes well, I think, for people committed to 7 for the foreseeable future. There's been a long history of Drupalcons discussing non-Drupal topics, but now that 8 delegates so much to external libraries, they can be discussed in a strong Drupal context, and it feels less like vacationing in someone else's technology and more like going for a hike through shared, friendly territory. There was an entire Symfony track, that included a comprehensive discussion of dependency injection by Nicolas Grekas, remarkable in the fact that although it was Drupal-oriented, only the last few slides described the Drupal-specific "topping", spread on an otherwise-Symfony stack. Elsewhere, HTTP was heavily discussed, with Lorna Jane giving a great talk on HTTP; elsewhere, Guzzle, Service Workers and HTTP/2 were added to the general standards mix. From a purely DX perspective, David Porter's session showed that Varnish has also finally come of age as a testable, architectable technology rather than something beautiful but arcane. Thanks in a large part to the skills and hard work of Emma Karayiannis, Gábor Hojtsy and Karyn Cassio in bringing it all together, this was the first Drupalcon to have a Being Human track. This included alimac's talk on pre-empting burnout through effective large-scale systems and processes; a talk from Jenny Wong (a Wordpress community manager) on how we might build bridges between us, and learn from what other communities have already discovered; and Justine Pocock's brave, brutally frank story of how she made her way out of a bad time in her life, to become the wiggly koala we now know and love. If there's one thing we could learn from Emer Coleman's striking keynote on the unavoidable moral dimension of the software we develop and the (only apparently) sterile coding decisions we make that affect people's lives, it's that tech's problems are fundamentally social problems, and they both affect and are affected by the wider society we live in. I hope that this new track, coming on the heels of such things as Geek Mental Help week and Mike Bell's own talk last year about (his and all of our) mental health, signals a new trend in talking about the fact that not only are we human, but that tech—being an adjunct of us and not the other way around—is a human domain too. Drupal 8's new architecture lends itself much more strongly to talking about specific, topic-bundled APIs, and there's always another one you haven't heard of: Matthew Radclife's talk on typed data was a great case in point, and personally I saw plenty of sessions discussing an API at a time. There's no doubt that the DX in Drupal 8 is—for most, and for the most part—much improved on that of previous versions. But in the same way as we can now move from discussing coding problems to social problems, we should also consider this a good time to shift the focus of improvement from the developer experience, to that of the end user. As Angie Byron's revealing talk about the experiences of using Drupal's key "competitors" made clear, the end user is ultimately the person who has to work with Drupal on a day-to-day basis as part of their wider job: they might be improving an organization's member communications; promoting new products on the e-commerce website; or increasing donations to a charity. Most importantly, they're not developers. It's never a pleasant experience watching actual videos of user experiences—the obvious pain points make you cringe—but it gets to the very heart of how we might bring the experience of using Drupal to the next level. Outside of the narrow DX, there's another initiative that could do a lot to improve everyone's experience of Drupal: the ongoing Documentation initiatives. Joe Schindelar gave a great talk about all the different ways in which the documentation—always sprawling and uneven, however (over-)complete and interesting it might be—is being improved. On the one hand, existing documentation is being coralled into a different "guide-based" framework, with each guide or subsection having an owner or informal moderator. On the other, a separate, contained project has created what might be the "canonical Drupal user guide" from scratch, with a clear remit and standard formats applied from the very start. Between these two efforts, documentation should end up much improved. I should end with a mention the mentored and first-time sprints on the Friday. This is in keeping with everyone's slide decks: there was clearly an attempt by the session track organizers to get all speakers ending their slides with an advertisement for the sprints, and it paid off in spades: sprint rooms were full to bursting, with people even sprinting in the coffee area between rooms. The mentored sprints—which I had a great fun volunteering for—were simultaneously hard work and a total joy as always. Rachel Lawson, YesCT, alimac and others provided the usual high quality and quantity of organization, meaning it all went like clockwork; moreoever, the last-minute decision by four sponsors (Druid, Amazee, 040lab and Open Development) to cover the cost of a post-sprint meal for the mentors was an unexpected treat. 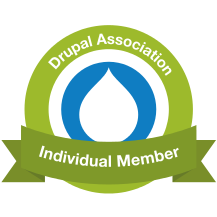 We volunteer our time for the good of the Drupal project alone, but it's really gratifying to have our contributions recognized so generously. No spaghetti al'arrabiata is ever truly guaranteed, but all the same... maybe you should spend some time at the sprints next time. With that in mind, hope to see you in Vienna next September!